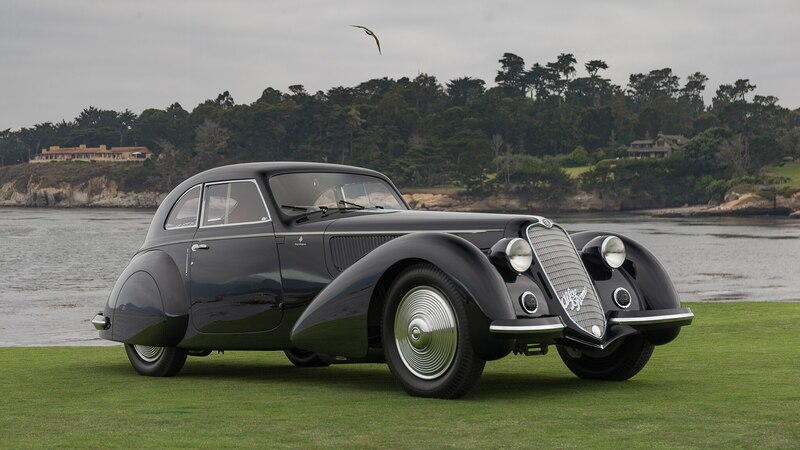 To paraphrase George Orwell, all Alfa Romeo 8C 2900B Carrozzeria Touring coupes are beautiful, but some are more beautiful than others. 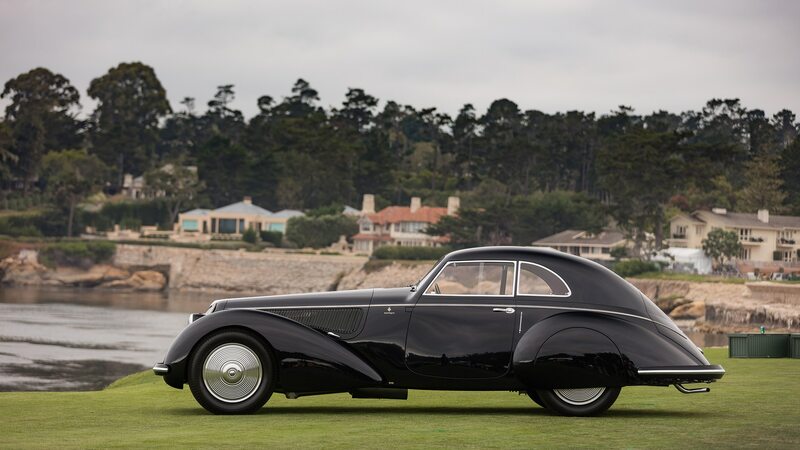 This year’s Pebble Beach Concours d’Elegance Best of Show winner is a magnificent car, a worthy recipient of the Billionaire Car Club’s ultimate grand prize. 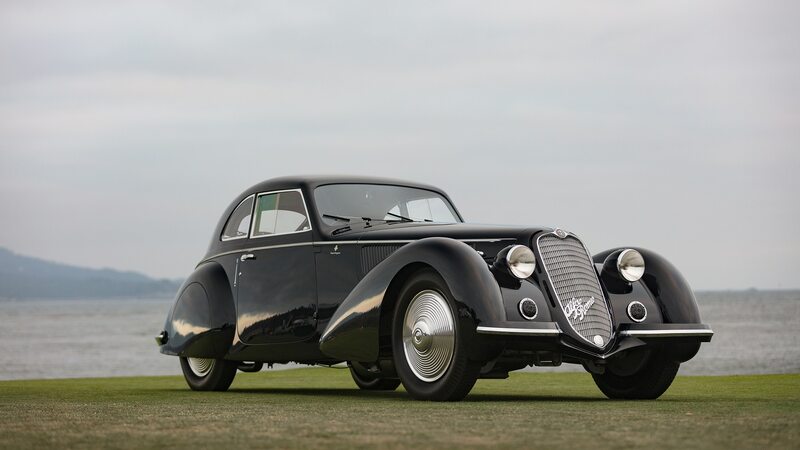 But in my not at all humble opinion, it is not as good as is the nearly but not quite identical 1938 Alfa 8C (chassis No. 412035) that won BoS 10 years ago and was later featured in By Design. How can I say that, when the two Alfas have exactly the same basic form and characteristics, even almost the same very dark blue paint? 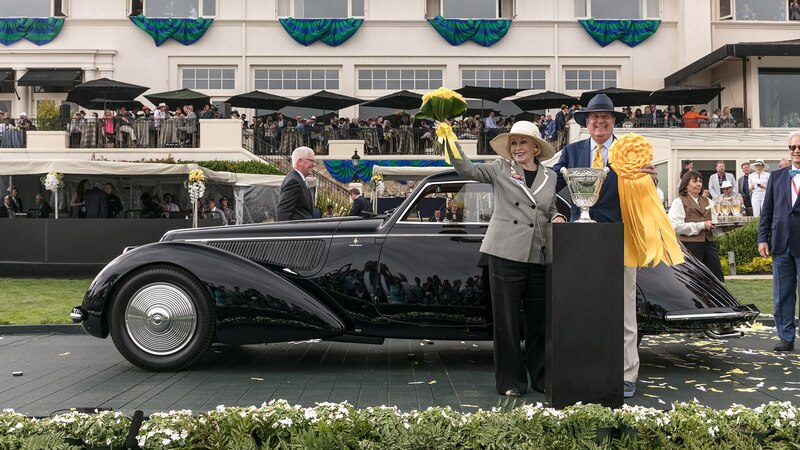 The happy owners pose with their big prize, but what really counts is having the Alfa Romeo 8C 2900B. Back then I also mentioned “the wart-like rear lamp cluster, stuck on as though it were an afterthought.” On this earlier car it was nicely flush to the surface beneath a license plate recess simply left off of the later one, as were catwalk-mounted horn grilles, to considerable aesthetic advantage. The bright trim for the trunklid keyhole is just below the backlight on the 2018 winning car, while on 035 it punctuates the pointed tail of the roof where it intersects with the tapering lower body. 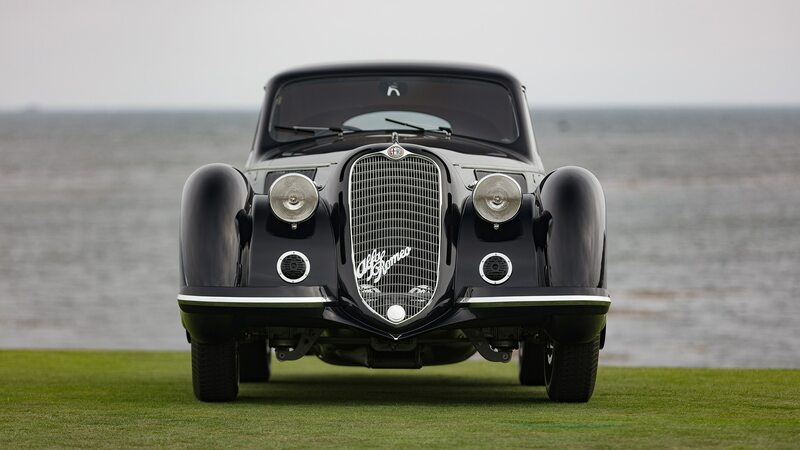 I believe there were only five or six of these flowing Touring Berlinettas; most of the 8C 2900Bs having been short-chassis sports cars for Le Mans and the Mille Miglia, won four times by Alfa 8C 2900s. 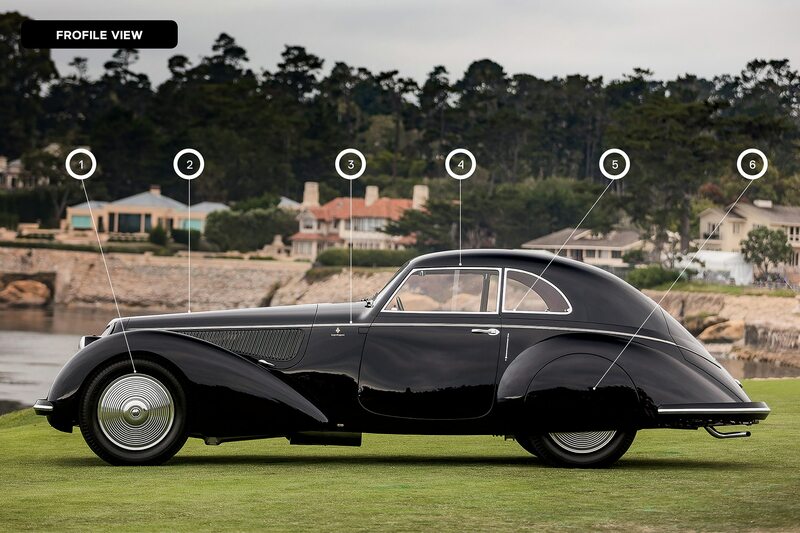 Theme and variations for Best of Show at the Pebble Beach Concours d’Elegance: The same Touring design, more refined as executed a year later, won 10 years ago. Is there a third example waiting for 2028? 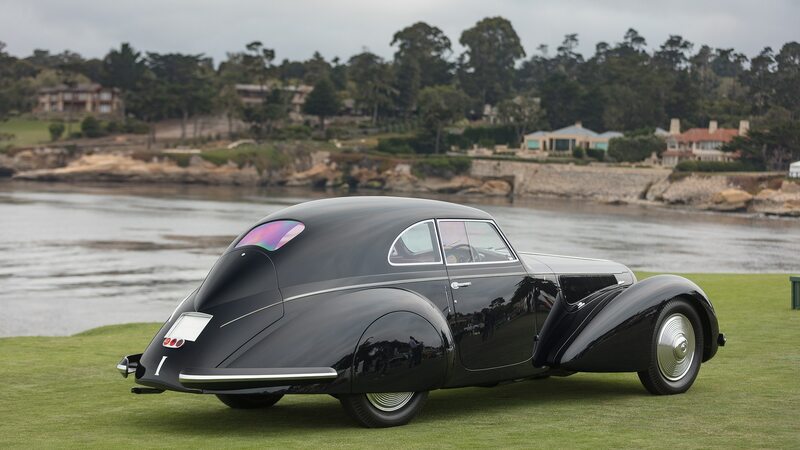 On this car the hood side louvers are aligned with the cowl/hood cut, but on the later car there were bright metal accents on each louver, and they continued for four additional trim pieces onto the cowl sides as well, giving the impression of an even longer hood. Headlamp shells were plated on the 2008 winner, painted on this one. And the 035’s grille was longer, continuing below the starting crank trim cap in a soft curve at the bottom, though this car has a lower point, just clearing that cap. 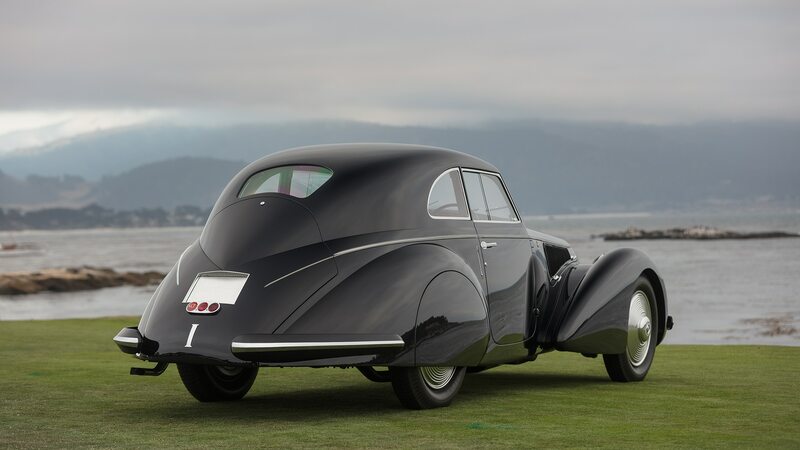 Wire wheels had magnificent concentrically ribbed covers for aerodynamics, and I suspect it was more to allow them to be admired than for brake cooling that rear fender skirts on some coupes were perforated with various slot designs. This car has none, but 035 had six per skirt. Whether they were true to the original Touring design, I can’t say. Years ago I saw a pair of solid skirts being cut in Phil Reilly’s restoration shop in California. None of the 8C 2900s left are in anything like original condition. Good as they were, the artisans of Carrozzeria Touring never achieved superb finishes like all remaining cars now sport—save perhaps the pale blue example in the Alfa Romeo Museum in Arese. 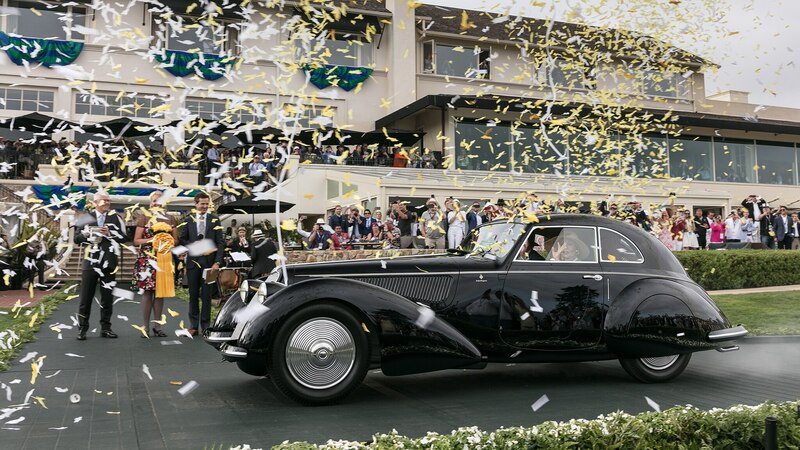 All are 80 years old and have been primped and pampered and “improved.” The one Phil Hill bought to race at Pebble Beach in 1951 has been hyper-restored for Ralph Lauren and painted Pebble Beach trophy black, not Italian racing red. Sic transit gloria mundi. 1. Best wheel covers ever? 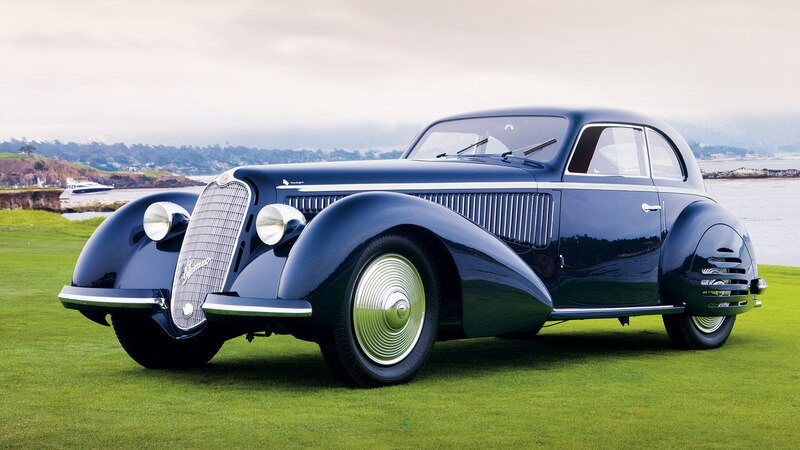 They’re certainly extraordinary and were on this car at the 1937 Paris auto show. 2. The hood tapers downward sharply from the windshield base to the top of the grille, which is excellent for aerodynamics. 3. 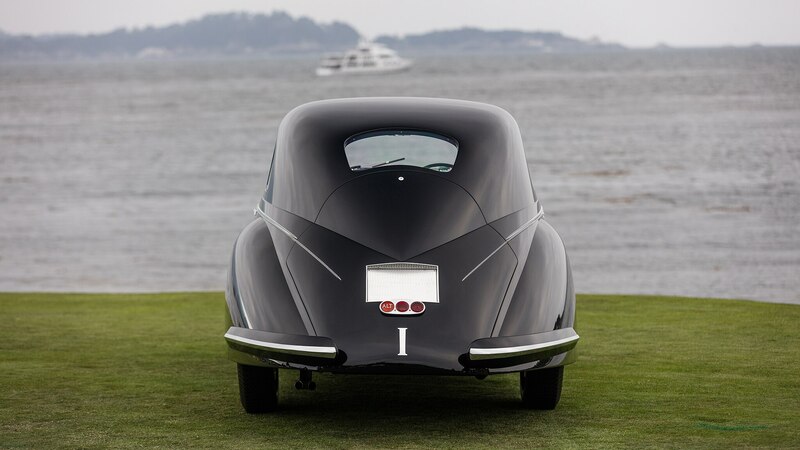 The body side trim strip is actually in two parts; the upper section extends past the lower one at the front but stops at the trunklid cut at the rear. 4. The door-window trim is almost dead straight, in contrast to the very rounded roof profile. 5. It’s hard to believe Touring made this clumsy misalignment error, but perhaps it came about in a restoration. However it happened, it’s jarring. 6. The solid skirt completes the rear fender form as though it were the wheel pant of a ’30s fixed-gear airplane. 1. Trim strips on the bumpers, front and rear, provide a datum line for the entire composition. 2. These grilles on the lower catwalk are not exactly disgraceful, but they are clearly not a positive element. 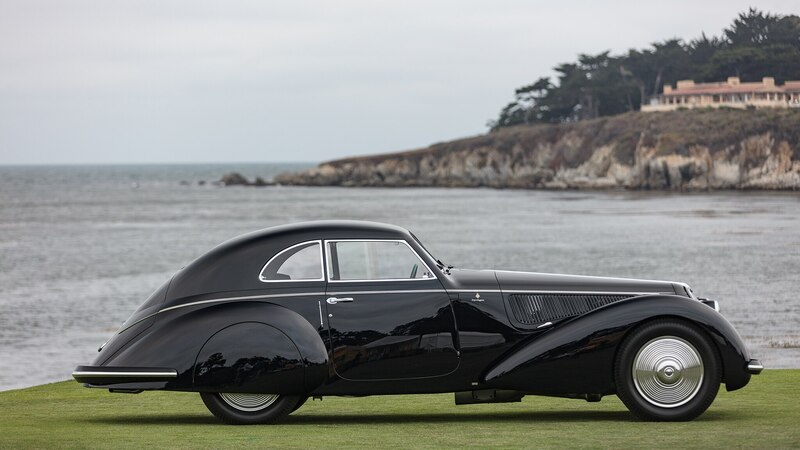 They were eliminated on the 1938 8C 2900B that was Best of Show ten years earlier than this 1937 first execution of Touring’s elegant berlinetta. 3. The nominally horizontal elements of the grille texture arc upward when seen from dead ahead on this car but are less curved on the later car. 4. 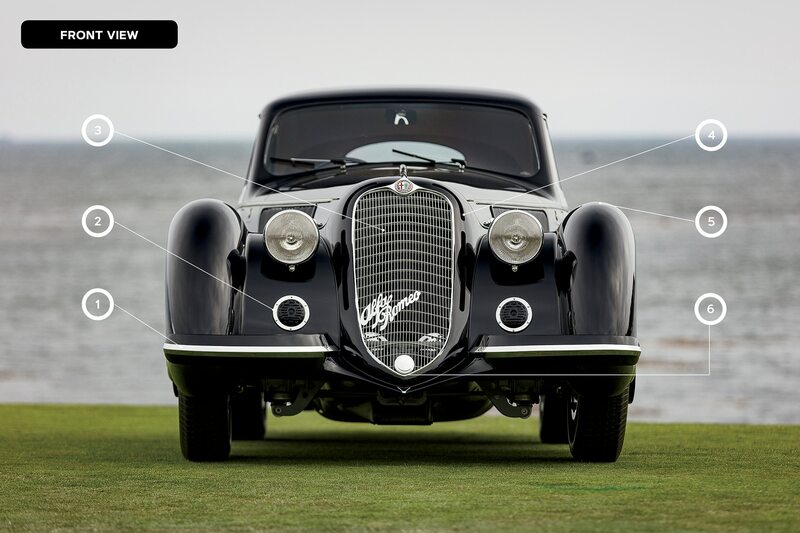 Traditional outside-the-grille slots as seen on generations of Alfa Romeo racers are unobtrusive on this nearly black car. Too bad, as they’re a really nice design element. 5. The perfection of the front fender form is maintained in the head-on view. 6. 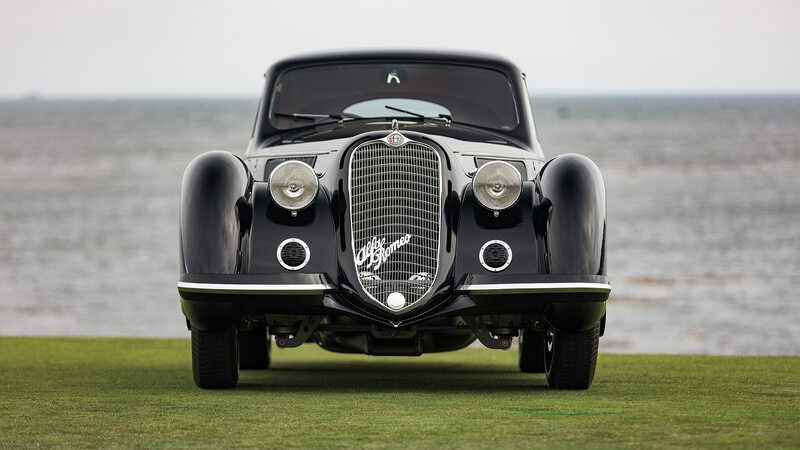 The grille frame is nearly pointed on this early car, softened into a rounder curve on the longer grille of the 2008 BoS winner. 2. 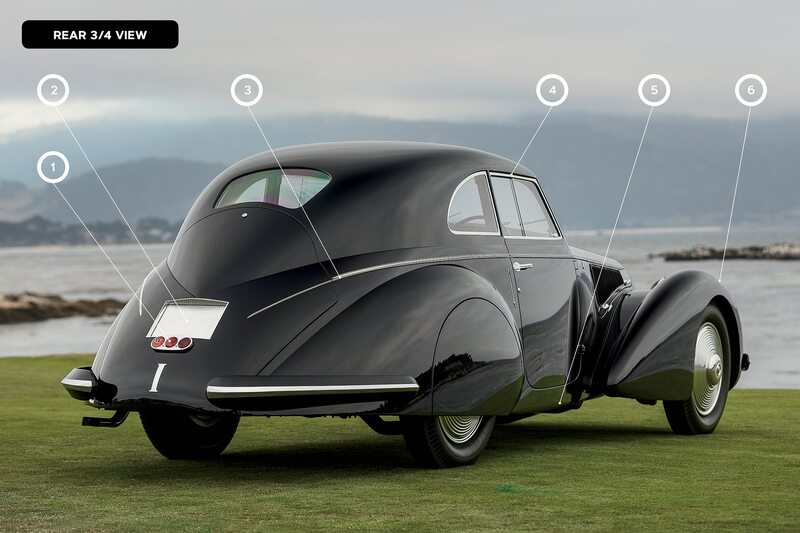 … the large rectangular license-plate recess, which was left off later evolutions of the basic design. 3. This bright trim piece flows in an elegant arc when viewed in profile, but there is a noticeable break at the front of the door. 4. Top and bottom of the door window are parallel to the ground plane, as are the bumper trims. 5. The body widens all the way to the bottom of the doors then turns under in a tight radius. 6. There is no “almost” to the front fender form. It is perfect. 1. 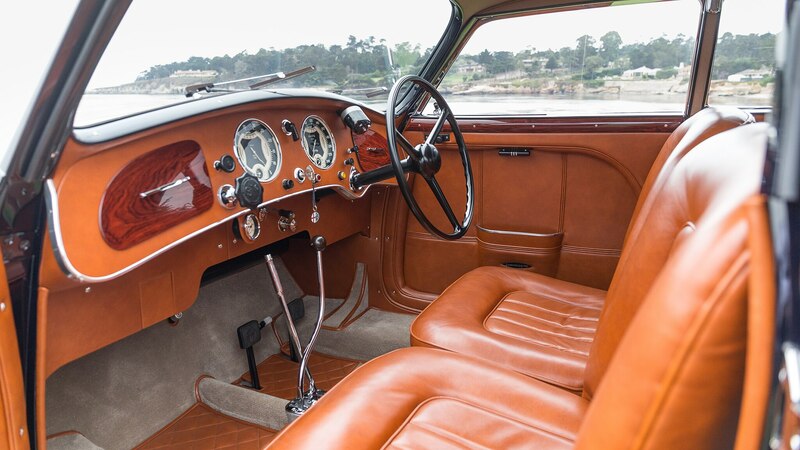 The way this lower instrument panel perimeter trim drops below the steering column is elegance personified and a tribute to exquisite craftsmanship. 2. The same goes for the juxtaposition of polished wood for the glove box door on the leather-covered panel. 3. Elaborate graphics on the faces of the two giant gauges are impressive. 4. 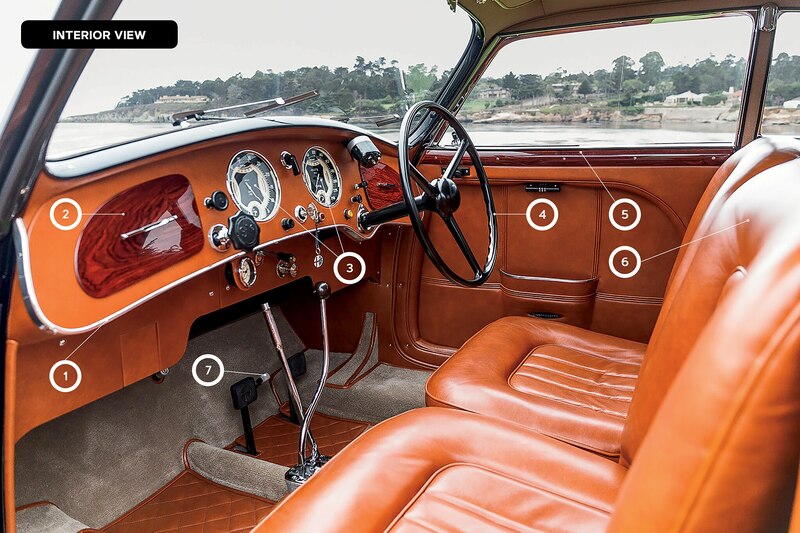 A single-piece hard rubber steering wheel may seem out of place to modern eyes, but this is exactly how the cars were equipped in their time. 5. Polished wood sill caps go perfectly with the understated elegance of beautifully executed leatherwork. 6. Not as elaborately contoured as seats tend to be today, these are nonetheless shaped to provide some lateral support in hard cornering. 7. 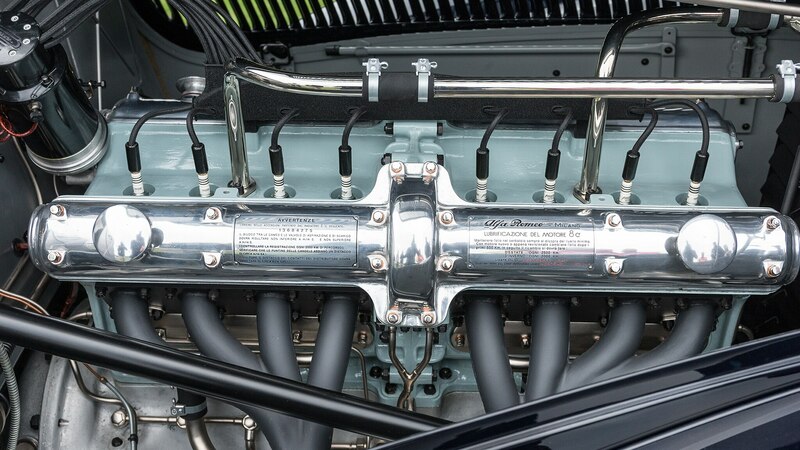 The throttle placed between the clutch and brake pedals was typical of race cars for decades to facilitate heel-and-toe footwork—back when the term was actually an accurate description of the art of rev matching.